On 16 November 2018, the CED delegates elected the CED President and three Directors. Dr Marco Landi was elected for his second term as President. Dr Henk Donker was elected as Director and Dr Piret Väli and Dr Hans Schrangl were re-elected as Directors. The CED welcomes the publication of guidelines on Infection, prevention and control in dentistry on the ECDC website. Together with the other members of the medsdisposal platform, the CED signed a joint statement on pharmaceuticals in the environment. CED President Dr. Marco Landi met with the President of the Association for Dental Education in Europe (ADEE), Prof. Stéphanie Tubert-Jeannin to sign the position statement calling for Member States to prevent illegal education practices by complying with all provisions listed in the Professional Qualifications Directive (PQD). CPME, PGEU and CED have reached out to Commission President Juncker and Budget Commissioner Oettinger to call on the Commission to include a separate health programme in the post-2020 multiannual financial framework (MFF). Click on Read More to see the full letter. The CED has signed the Joint Statement and Call to Action on AMR that were a result of the EU Health Policy Platform's Thematic Network on AMR, led by the European Public Health Alliance (EPHA). Other signatories of the documents include patients' organisations, human and veterinarian health professionals organisations, and consumer organisations. The CED signed the Digital Health Society (DHS) Declaration launched by the Ministry of Social Affairs of Estonia and ECHAlliance. The Declaration is a call for actions about the strategies to achieve the digital transformation of healthcare systems. The DHS Declaration was officially presented and signed during the eHealth conference which took place in Tallinn on 16-18 October, and it will also be the support document for the EU Council Recommendations to be published in December 2017. The Digital Health Society Group is an initiative of the upcoming Estonian Presidency. The Ministry of Social Affairs of Estonia is launching the Digital Health Society (DHS) Declaration, as a call for actions about the strategies and actions to achieve the digital transformation of healthcare systems. This Declaration will be developed collectively through the Digital Health Society group. The CED - led by the Board Task Force Antibiotics - submitted its answers to the European Commission's consultation on possible activities under a "Commission Communication on a One Health Action Plan to support Member States in the fights against Antimicrobial Resistance" on 27 April, 2017. Today CED attended the press event organised by ECDC (European Centre for Disease Prevention and Control) on European Antibiotic Awareness Day (#EAAD2016) and participated in the live Twitter chat during the event. The Council of European Dentists (CED) is looking for a Policy Officer for its secretariat in Brussels. This position is intended to be a full-time (38 hours per week) permanent position, starting as soon as possible. The European Antibiotic Awareness Day (EAAD) is an annual European public health initiative established in 2008 and held on 18 November. It is led by the European Centre for Disease Prevention and Control (ECDC) with support from the European Commission, European Parliament, EU Member States and non-governmental health stakeholders across the EU and aims to raise awareness about the threats of antibiotic resistance to public health and the responsible use of antibiotics to maintain their efficacy. On 5 September, the CED Board approved the CED response to the public consultation on “Proposals for draft EU guidelines on the prudent use of antimicrobials in human medicine”. The draft guidelines were developed by ECDC on a request by the European Commission and will then be used to support the Commission to prepare a final EU guidelines document. Today, the CED publishes the third and final report on undesirable effects caused by of tooth whitening products. This report covers the period from 2014-2015 and was prepared under an agreement signed between the CED and the European Commission on 31 March 2010 in the framework of the future regulation on the use of tooth whitening products (Directive 2011/84/EU later repealed by Regulation 1223/2009). On 25 May, the CED President Dr Marco Landi met with the Commissioner for Health Dr Vytenis Andriukaitis. Dr Landi presented the CED work in the areas of health workforce, antimicrobial resistance and public health (sugar). He also shared the CED concerns with regard to standardisation of healthcare delivery and corporate ownership of dental practice. The Commissioner expressed an understanding of these concerns. As CED President stressed, just like patients, treatments cannot be standardised but should be guided by the evidence-based expertise and professional ethics of the dentist. Dr Landi also insisted on the importance of independence of dental practitioner in case of corporate-owned dental practices. On the topics of health workforce, antimicrobial resistance and sugar, all agreed that these are areas where dentists can make a significant contribution. Public health should be considered when the European Commission formulates proposals on alcohol excise duties, the CED warned in its letter of 25 November. Commenting on a public consultation on the review of the existing "structures" legislation of excise duties on alcohol and alcoholic beverages, CED President Dr. Marco Landi and Chair of Working Group Oral Health Dr. Hendrike van Drie noted the destructive effects of excessive alcohol consumption on oral and general health. Today the CED releases its 30 seconds video to celebrate the European Antibiotic Awareness Day (#EAAD). Dr Susie Sanderson, Board Director and Chair of CED Board Task Force Antibiotics, explains what dentists can do to fight against antimicrobial resistance. The video was prepared together with the British Dental Association and can be seen here. The CED is a partner working closely with the European Center for Disease and Control (ECDC) in raising awareness to the prudent use of antibiotics as well as of everyone’s role in keeping antibiotics effective for future generations. Citizens are being encouraged to always follow their doctor’s advice on when and how to use antibiotics. Today the CED published the second report on undesirable effects caused by tooth whitening products. This report covers the period from 1 November 2013 to 31 October 2014 and was prepared under an agreement signed between the CED and the European Commission on 31 March 2010 in the framework of the future regulation on the use of tooth whitening products (Directive 2011/84/EU later repealed by Regulation 1223/2009). Released today the 3rd issue of the 2015 CED Activities Info. This issue informs about the event on oral cancer co-organised by the CED in the European Parliament and reports about CED political activities. In Section II, CED member associations inform about their national activities. Ahead of the 8 July vote in the European Parliament’s plenary on its recommendations to the European Commission on the TTIP, the Council of European Dentists (CED), the Standing Committee of European Doctors (CPME) and the Pharmaceutical Group of the European Union (PGEU) request MEPs to support § 1, point b, point vii (voting list) on the exclusion of public health services from TTIP. The CED is organising a public event on Oral Cancer: Dentists saving lives. The event will take place on 23 June in the European Parliament in Brussels and will be hosted by Mr Alojz Peterle, Member of the European Parliament and President of the MEPs against cancer (MAC) Group. For more information and registration, please click here. 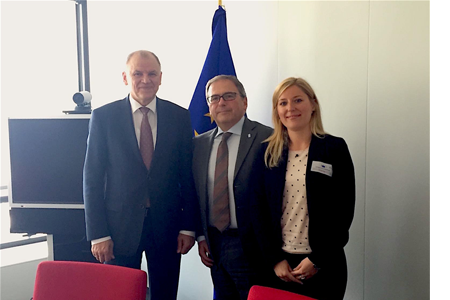 On 28 January 2015, CED President Dr Wolfgang Doneus met, together with the CPME President Dr Katrín Fjelsted, the new European Commissioner for Health Dr Vytenis Andriukaitis. Read more about the meeting in the latest CED newsletter. Today, the CED co-signed a letter of health stakeholders to the European Commission President Jean-Claude Jucker, asking him to reconsider the proposed division of competences in the new Commission and keep medical devices under the responsibility of DG SANCO and Commissioner for Health. This report was prepared under an agreement signed between the CED and the European Commission on 31 March 2010 in the framework of the future regulation on the use of TWPs (Directive 2011/84/EU later repealed by Regulation 1223/2009). Following the adoption in March 2014 of the final opinion on 'Environmental risks and indirect health effects from use of dental amalgam' by the Commission’s independent Scientific Committee on Health and Environmental Risks (SCHER), the fact sheet intended for non-specialists has now been amended and is available here. The CED contributed to the opinion. In the run up to the European Parliament elections in May 2014, CED President Dr Wolfgang Doneus is calling on European dentists and other voters “to vote to make the European Union a real democracy for all citizens.” With this message, the CED is joining the European Movement International's pro-European campaign on a 1000 reasons to vote for Europe. See the CED’s message here. On 15 January, CED President Dr Wolfgang Doneus and the President of the Standing Committee of European Doctors (CPME), Dr Katrín Fjeldsted signed in Brussels a Memorandum of Understanding to reaffirm the commitment of both organisations to cooperate to achieve high quality of healthcare for every patient in Europe. CED and CPME Presidents agreed that this year the main priority is the antimicrobial resistance, committing to promote prudent prescription practices and to raise awareness about the importance of preserving antibiotics’ efficacy. They further agreed to meet on an annual basis to exchange information and discuss common issues of the EU agenda affecting dental and medical professions. The MoU formalises the long-standing history of collaboration between both organisations. Doctors, Dentists and Veterinarians advise on "How to use antibiotics responsibly"
The CED is cooperating with the Federation of Veterinarians of Europe (FVE) and the Standing Committee of European Doctors (CPME) to raise awareness on the appropriate use of antibiotics. Antibiotics are vital to treating and preventing the spread of disease in animals and humans. But the risk that the bacteria causing a disease will develop a resistance to an antibiotic increases every time it is used. Once bacteria are resistant, the antibiotic is ineffective and can no longer treat the disease. Help us save lives and make sure that antibiotics stay effective now and in the future by following these tips. For further information please see our leaflet and press release.